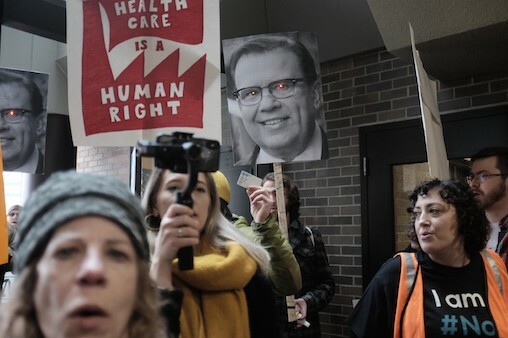 Detroit DSA demanded that Governor Gretchen Whitmer remove Blue Cross Blue Shield CEO Dan Loepp from her transition team, citing BCBS’s role in benefiting from the private insurance model. When Whitmer declined, DSAers decided to march on the Blues’ Lansing headquarters to demand Loepp step down. On December 14, two dozen organizers reconnoitered at a nearby library, mostly from Detroit DSA but also from other progressive groups. Some came from as far away as Holland. Before protestors even left the library, Capitol police arrived to tell them they would intervene if either side broke any rules. Blue Cross Blue Shield was ready, too. When activists arrived at the doors, they were locked. Several security guards and maintenance employees stood behind them. Coincidentally, a Jimmy Johns delivery driver pulled up just as the demonstrators arrived. 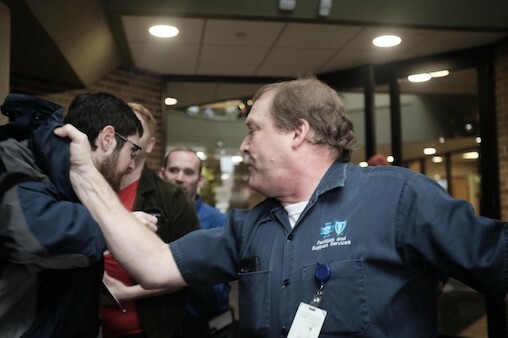 When the door was opened, every protestor pulled out their BCBS membership card and proceeded through the doors after the delivery. They demanded, as paying customers, that they should be able to get a meeting. Security and maintenance employees immediately began shoving. One employee told a protestor they would be in “a world of hurt” if they came any further. 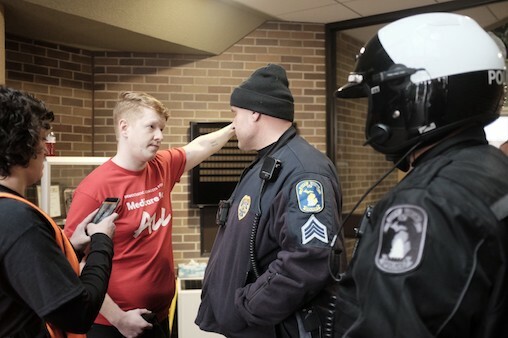 The police intervened such that only activist William Toms could remain in the lobby, lodged in the second set of doors, requesting a one-on-one meeting with a BCBS executive or with Dan Loepp himself. Protestors heard many support honks from passing traffic, and WILX Lansing did an interview with Detroit DSA Medicare for All co-chair Sean Lehman. Michiganders from Grand Rapids to Detroit to Marquette shared live video and pictures on social media under the hashtag #LoeppStepDown. DSA made it clear that Loepp’s position on the transition team was a betrayal of Michiganders who had elected Whitmer to represent their interests. In a response to Detroit DSA’s petition drive, Whitmer’s team confirmed that Loepp would be working on healthcare policy rather than general transition logistics. Blue Cross Blue Shield enjoys complete monopolistic power in Michigan and expends capital on campaign donations to keep it that way. The insurance giant gave more to Whitmer’s campaign than to any other gubernatorial candidate, and it did so to gain a seat at her table. It was out of the question to allow Blue Cross’s CEO to draft state policy that would preserve its market dominance and avoid any regulations that could help struggling Michiganders. DSA’s push for Loepp’s removal demonized him enough that Whitmer chose not to appoint him to her cabinet. It was an opportunity to critique private insurance and show Michiganders’ general disdain for the state’s largest insurer. Perhaps this is also a lesson in how it is possible to hold Democratic politicians accountable when their campaigns depend on corporate financing. We’ll remember this lesson in future elections.